Accessories: Accompanied by Rolex guarantee, wallet and fitted presentation box. The Milgauss is the result of a direct collaboration between Rolex and the Geneva-based nuclear-research organization, CERN - Centre Européen de Recherche Nucléaire (European Organization for Nuclear Research). Their aim was to develop a wristwatch that could withstand intense magnetic fields and thus be worn by the CERN engineers and laboratory workers constantly in highly magnetic environments. 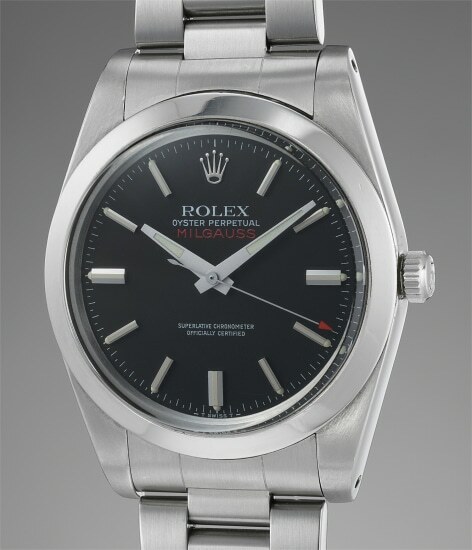 Reference 1019 was introduced to the market as the successor of reference 6541 and 6543. While the new Milgauss retained its Faraday Cage in order to protect the movement from electromagnetic waves, the model also featured a fresh and modern update to its appearance such as a smooth bezel and modified dial layout. Offered with its original guarantee, this watch is preserved in excellent condition with sharp bevels and crisp edges. Furthermore, the luminous on both the hands and numerals have aged evenly to a wonderful ivory tone.